The owner of a Brighouse cafe where ram raiders left a trail of destruction has thanked the community for its support since the incident. Naomi Sleigh, who runs Big Shots Cafe & Catering, based at Thornhill Brigg Mills on Thornhill Beck Lane, Brighouse, revealed the devastation caused by thieves who struck last Wednesday at around 7.45pm. “This is my cafe that I’ve put my whole life into over the last two years. Pictures showed the doors of cafe completely damaged and window panels broken with the shattered glass seen scattered across the floor. It is believed that the raiders used a car to ram the doors open. The suspects then entered the cafe and took the till containing money and alcohol from the fridge. Since then the community and customers have rallied to help the cafe and it reopened as normal this week. “It’s been an absolutely awful few days but we re-opened on Monday and we’ll be stronger than ever. The burglary is now being investigated by the police. 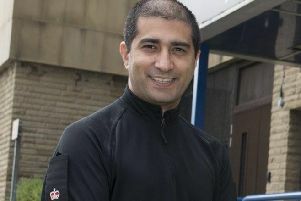 A spokesperson for West Yorkshire Police said: “It is believed suspects forced entry to the property by using a vehicle. “The suspects have stolen a till containing cash and alcohol from the fridge. Anyone with information is asked to contact police on 101 quoting crime reference 13190041941 or call Crimestoppers on 0800 555111.